Stardock is running a Tis the Sale Season sale that lets you nab most of their Windows customization apps on the cheap. I’ve been a long time user of Stardock‘s customization software. Since Windows 7 I don’t have as much a need for the desktop skinning WindowBlinds. Having said that, they still have some excellent and really useful software. 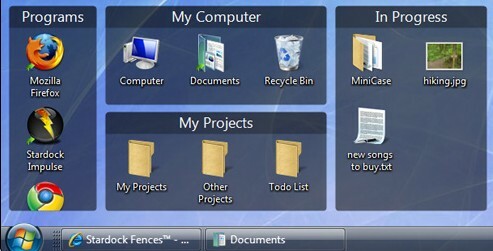 Stardock Fences Pro has become a must have application and one that I recommend to everyone, and everyone who tries it falls in love with it. I wrote about the first version of Fences way back in 2009 and it’s only gotten better since then. 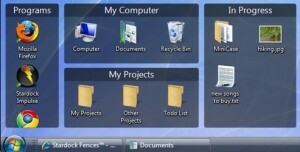 Right now you can snag Stardock Fences for less than $8! Fences allows you to draw labeled shaded areas on your desktop, which become movable & resizable containers for your desktop icons. You can then use these groups to organize your computer’s desktop. It’s awesome for creating a clean, organized desktop. Stardock Multiplicity – Multiplicity enables you to control up to 9 PCs with only one keyboard and mouse. You can copy, paste, drag and drop files between PCs and centralize audio from all PCs to one PC. Multiplicity’s data encryption ensures your data is always secure. Stardock Acoustic Bridge – Acoustic Bridge gives you the power to redirect audio from one PC to the speakers of another PC. This enables you to send the sound from a PC with your music collection to any other PC on your network. Stardock ObjectDock – Organize your shortcuts, programs and running tasks into an attractive and fun animated dock. There are free alternatives to this one but hey.. it’s been downloaded more than 10 million times so it certainly has appeal. Get in on the action over at the Stardock Tis the Sale Season to score some great applications at a great price.